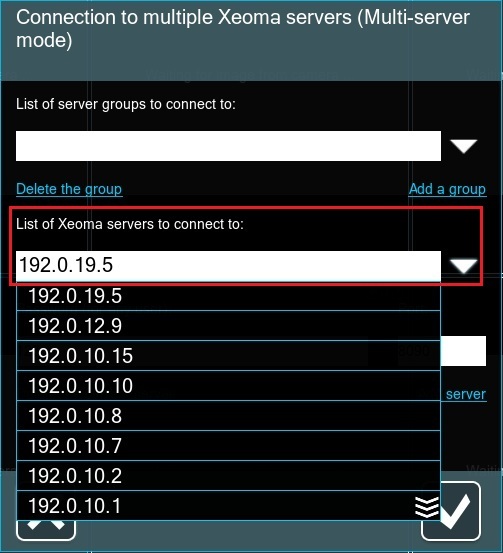 Let’s assume you have several devices and you want to connect from device #2 to the device #1 with Xeoma on it. 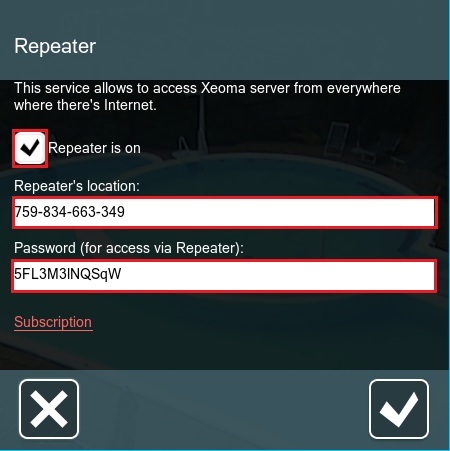 Xeoma offers several approaches for the remote view: client-server connection, Repeater function and browser viewing. Important: Make sure you have port-forwarding and static IP at your office (on machine #1) to connect from outside (from Internet) or use Repeater service to be able to connect even to firewalled office computer. 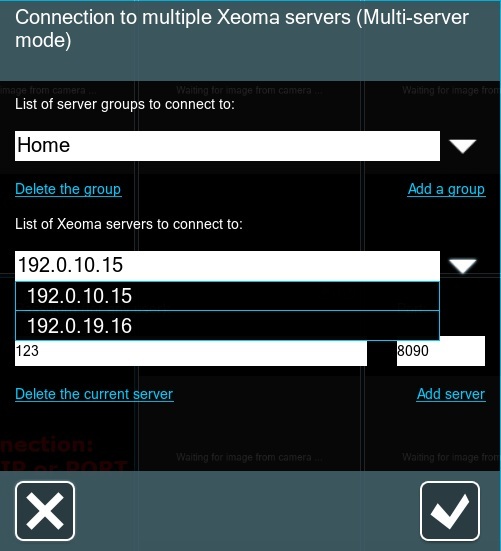 Xeoma consists of two parts: Server and Client. Server part does work with cameras, microphones, takes screenshot, records on disk, can upload images and video to an FTP server, transfer them to Internet, by email, etc. License activation is used for Server part. Client part is for viewing cameras from Server, to configure modules, etc. It is free to use. Important: we recommend to use both server and client of the same version. Using this type of connection you will be able to view cameras and archive, change settings. This type of connection works only if your PC, where Xeoma is installed, has the static IP address. If a static external IP address is impossible to get, you can use its substitutes (free or paid dynDNS services, or the Repeater service). You need to install Xeoma on the PC #1 (server). Run Xeoma on the PC #1. It will be the server part. Click ‘Install’ in installation menu below the main window (or field of work). Make sure ‘Server autostart’ and ‘Hidden mode’ boxes are checked. Write down the password for the remote access to server. Press “OK” button to install the server. Xeoma server, configured to “autostart on reboot” will work on any reboot. You can also change the remote access password. On PC #2 you need to open Main menu -> Remote access -> Connect to and type PC #1 IP address and password. 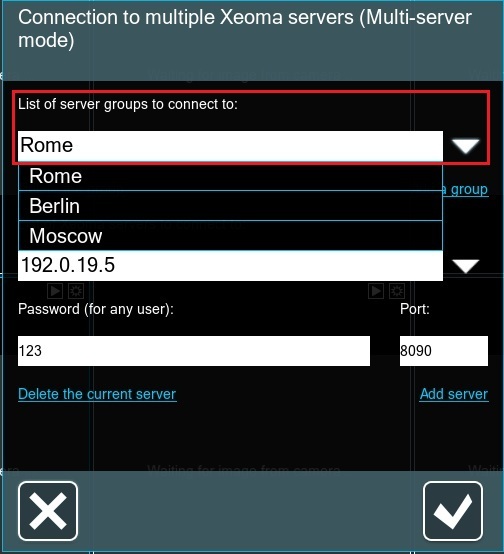 Multi-server mode is very useful for the control of large holdings with offices in different cities around the world and a multi-level control system. In such systems, servers might located in different locations geographically, and even in different cities. 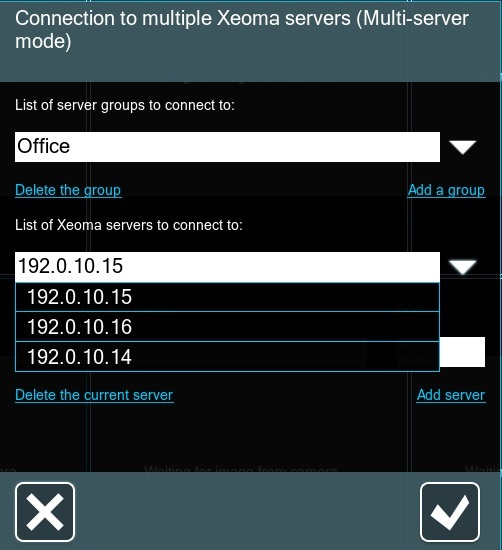 With Xeoma’s Multi-server mode you can connect to all of them at a time and/or switch between the offices to get the full insight and raise the efficiency of monitoring. Simply add all server you’d like to connect to to the list in Main menu -> Remote access -> Multi-server mode. If, for example, you need to view cameras from several servers at a time, then view cameras from several other servers, and then reconnect to the first group of servers, you can use grouping in Multi-server mode for quick access this or that group of servers. This configuration can be done in two ways. Add all servers you’d need to connect at various times. 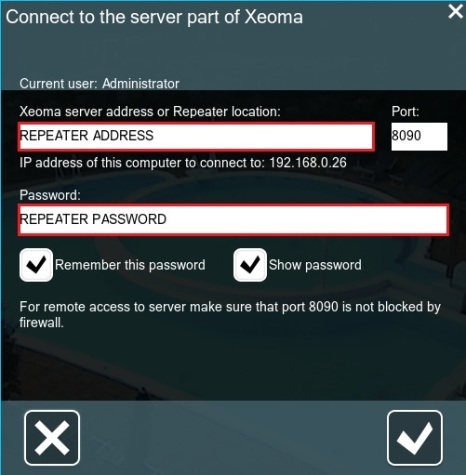 To do this, enter the servers’ IP address, port and password in the field “List of Xeoma servers to connect to”, and then click “Add server”. Then, when all servers are added, add the names of the groups. Enter a new name in the “List of server groups to connect to” instead of the name that is already there, and click “Add group”. Now when you have added all the servers and groups, we turn to fine-tuning the groups. Open a group, and remove unnecessary servers, that you will not need this group to connect to, from the list (it does not affect the server lists for other groups). Do the same for other groups, leaving only those servers inside a group that you’d want to connect to when you select this group. It is suitable for those who have just a few servers and only several groups to connect. You can add the name of the group and immediately add all the needed servers to it. If you don’t have the static IP address, you can use the ‘Repeater” function. Using this type of connection you will be able to view cameras and archive, change settings. The ‘Repeater’ function is available 10 min per day for free. You can buy monthly or yearly subscription. You also need to install Xeoma on the PC #1 (server). Address and password for ‘Repeater’ will be generated automatically. Please make sure the box ‘Repeater is on’ is checked. Write down the repeater’s address and password. Type the password and address. If you have difficulties with Repeater activation, please try to temporary turn off or uninstall your antivirus. Then activate Repeater and turn on (or install) antivirus again. You can also watch the videotutorial on how to work with the ‘Repeater’. How to activate the Repeater? 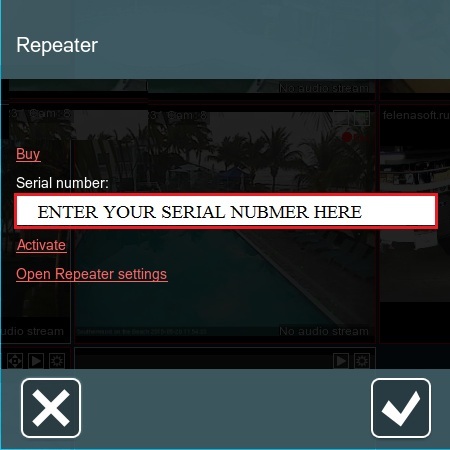 To activate the Repeater license сhoose the “Subscription” option, enter your serial number and click “Activate” button. If your PC has static IP address we recommend to use browser view for mobile devices. You will be able to view cameras both in real time and archive. For this option you will need to use ‘Web Server’ function. Connect the ‘Web server’ module to the camera in chain. Enter its settings, where you will find the links (URLs) to access various streams – JPEG images, MJPEG video, Flash video with sound, web server general page to view all cameras that have a ‘Web server’ module connected to them on this computer. Please note that by default the links are for view from within the same network; that’s why there contain “localhost”. For remote view from outside of this network you need to replace localhost with the computer real static IP address.Note: the links are not editable within Xeoma. If required, you should edit the IP address in the web browser address bar or in a text editing program. Copy the needed link and paste it into the Browser. You can also watch the videotutorial on how to work with the ‘Web server’. We advise you to try all Xeoma possibilities in the trial version. This way you will get an opportunity to test all of program’s features and make sure Xeoma has all you need for most effective surveillance system. Trial version has no limitations in functionality except for all settings you specified will not be saved when you close the program and they will be reset in 48 hours. Full comparison table of modes can be found on our official site. If everything works the way you need, obtain and activate licenses for respective amount of video sources in Xeoma and for Repeater service (either for 1 month or 1 year of unlimited traffic use). Remember, you only need 1 license to activate the server part, every client part is free of charge. The same is with Repeater subscription: activate it on the server part and connect to it from away freely. You can discuss Xeoma on forum, ask any questions, search for answers, or share your ideas how to use Xeoma or how it helps you.